The parents of two children who were found stabbed to death in a bathtub last year on the Upper West Side say they are taking solace in their family to heal. Kevin and Marina Krim spoke Wednesday evening at a fundraiser for their nonprofit, the Lulu and Leo Fund, named for their two children killed Oct. 25, 2012. Their nanny, Yoselyn Ortega, has been charged with murder in their death. She has pleaded not guilty. Marina Krim discovered her children when she returned from picking up the couple's third child, Nessie, from a swim lesson. The couple rarely speaks in public about the deaths. Kevin Krim said that they found a reason to go on by turning to each other, and to their friends and family. "We had every reason to feel alienated from the world after this happened," he said. "And to really, truly survive and to live again, we had to have a reason to live." He said they miss their children every day, and they will forever. "We are just heartbroken," he said. "But they inspire us every day as well. Their lives give us a purpose." Krim, a CNBC digital media executive, said the art and creativity were important to Lulu and Leo, and that's why they started the fund — aimed at giving money to arts programs. 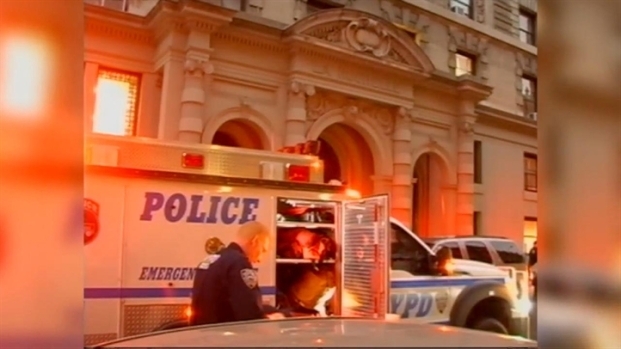 An Upper West Side nanny stabbed a 2-year-old boy and 6-year-old girl to death inside their apartment Thursday afternoon before cutting her own throat, police said. Gus Rosendale has more. The nonprofit late last month announced its first grant would go to Free Arts NYC, a nonprofit that provides under-served children and families with mentoring programs through the arts. The fund specifically supports the Free Arts "Parents and Children Together with Art" program, where families work to increase communication and teamwork. On Wednesday, the couple was hosting a silent auction with items like four tickets to Saturday Night Live, and an on-set pass for "Sesame Street." The event was hosted by Jim Cramer of CNBC's "Mad Money," and attended by Katie Couric.